This past Sunday, IEC Academy students walked to paradise with an amazing trip from Najaf to Karbala. 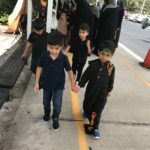 They participated on the Walk for Arbaeen and truly got to experience how it actually is. 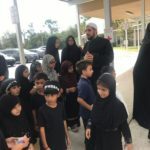 We split the students into two groups, one led by our Alim, Shaikh Mujtaba, and the other led by our visiting guest Zakira, Kauthar Hassan. 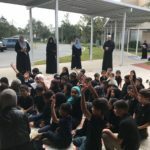 The Pre-K class first read a story about Pip the monster who had lost his heart and didn’t find it until he reached the shrine of Imam Hussein (a.s). They then watched videos and saw pictures on what the actual Arabeen Walk is like to see what they were about to experience. 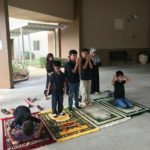 After meeting up with the rest of the classes in their group, they started their journey towards Najaf, while reciting Labbayka Ya Hussein. As Shaikh Mujtaba explained who was in Najaf and showed everyone how to condole Imam Ali and ask for permission to visit his son, the other group watched the videos and saw the pictures. Before they left for Najaf, Shayk also explained to them we are able to go for Ziaraat in Iraq because of the “Protectors of the Haraam”. 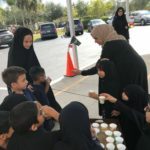 To honor them we set up a small collection box and the children put money in the box that will be sent to Iraq to be given to the real protectors of the Haraam. After they visited Najaf and sent salaams to Imam Ali and asked permission to go to his beloved son, they had reached the first Mawkib, which was about the tragedy of Karbala and how Bibi Sakina had suffered so much. As they continued walking on their journey, they were greeted by two young girls passing out some water for everyone. Next, they reached the second mawkib, the health mawkib, which was led by Dr. Aunali. They were ready with bandaids, injections and medications to treat anyone who had gotten hurt or needed medical treatment. 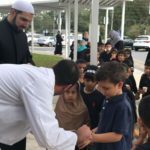 The children then headed to the the mawkib of Baby Aliasgher, where they were reminded of what happened on the day of Ashura. 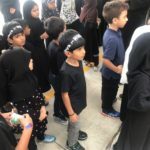 Everyone started to feel a bit tired in the heat of the outskirts of Karbala so they decided to rest at the rest and massage mawkib, where they were volunteers ready to massage their hands and feet. They were also given some food and juice for the journey ahead. They had finally reached Hazrat Abbas’s shrine and they gave him their condolences. After a long journey, they had arrived at our beloved Imam Hussein’s shrine, where they apologized for everything Yazid and his army had done to him and his family. All of the zawwars got to go home with an amazing memory of being able to experience the Walk to Paradise on Earth! 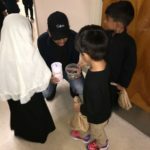 A sincere thank you to Allah for giving us this opportunity to be able to give the children the experience to Walk to Paradise. A huge thank you to everyone who made this possible, the team consisted of the IEC Admin, IEC teachers, IEC Parents, HIC community members and the children of our community. A total team effort from so many individuals all stemming for the love of Imam Hussain and love for children of our community. May Allah always shower you with HIS most sweetest blessings. Ameen.